I love trying out new facial products, as I really like taking care of my skincare. Once you have amazing "base" you don't need to wear a lot of make-up. 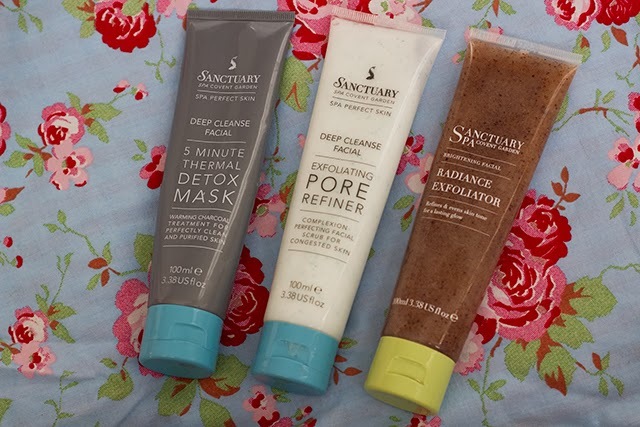 I really love Sanctuary Spa body products, as all smell so amazing! While browsing at Boots I came across their skincare products, Boots also was doing the 3for2 at that time. These three products really caught my eye, so I have decided to try them out. Recently my skin have been suffering with really bad breakouts, so I tried everything to control the breakouts. 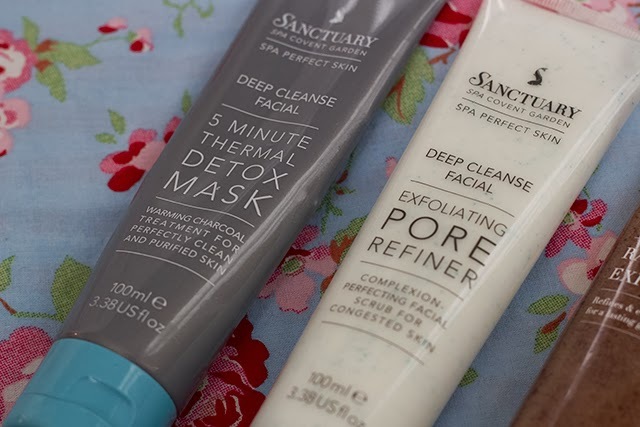 Sanctuary 5 Minute Thermal Detox Mask, whenever I use this mask my skin looks so much better! Before applying this mask I always use the Sanctuary Exfoliating Pore Refiner, just exfoliate my skin, so the mask would work a lot better. Before applying the mask I also slightly wet my face, so the mask would be a lot easier to apply over slightly damped face. When you rub the mask in between your hands you can feel the heat, you can also feel it once applying on face. I normally keep the mask on for around 10minutes, just to make sure it will work better. I like to apply it before going to bed, on the next day I will wake up with few new pimples, but in my opinion they are just the dirt the facial mask have removed from under the skin, if that makes any sense. The other spots I had on the night before, appear much more smaller the next day, my skin also feels a lot more softer. Sanctuary Exfoliating Pore Refiner, this is a creamy exfoliating facial wash with little blue particles. I firstly apply a hot cloth on my face to open up the pores, then I gently exfoliate my skin. I tend to use this exfoliator twice a week, as I notice when I been using it more often my skin became more sensitive. I don't really suffer with large open pores, but from time to time my pores just appear larger, and this exfoliator helps me to control them a lot. The face scrub also contains salicylic acid to protect against the bacteria that causes skin blemishes, it also contains seaweed which is used to balance out the skin oil levels. The smell is very fresh and I like it a lot. Sanctuary Radiance Exfoliator, this is the most amazing smelling product to use in the morning! I like to use it in the morning as it's makes me feel more awake, the fresh scent is really lovely. I been using it pretty much on daily basic and it doesn't do any harm to my skin. The skin is very soft after use. I really like the little exfoliating particles as they do their job really well. Overall each product costs £10.50, but in my opinion all are worth every penny! As all are amazing. I also must mention that I really like the slim tall packaging, as they don't take up a lot of space in the bathroom. The first mask sounds amazing, somethimes it's good to draw all the impurities to the surface of your skin! These products look like the answers to my skin problem prayers!! Thanks for sharing lovely.